Just over a week ago, the upcoming LEGO Pirates of the Caribbean line was officially announced. Now we’ve got some details from some members of Eurobricks, and it has been confirmed that they won’t focus just on the upcoming Pirates of the Caribbean: On Stranger Tides movie (due out in May of 2011), but will cover the Pirates of the Caribbean movie franchise in general. Look for Jaymercury’s post a few posts down on this Eurobricks thread. Also look for Christian’s post about half way down this Eurobricks thread. Obviously these are subject to change, but here is what’s listed (picked up from an accidental leak by a retailer), along with my thoughts. Yes, we have no pictures and no in-depth product descriptions, but I’m going to give my opinion anyways, based on the leaked description and the pricing. I’ll take a guess at brick count and US prices based on other Disney sets as well as the new Harry Potter sets. I’ve included the specific set names and numbers (and links to either the LEGO.com entry or to Brickset) for my comparisons so that you can check them out on your own and draw your own conclusion. US prices and brick count estimates are based on existing Toy Story, Prince of Persia, and Harry Potter sets, and the price conversions are done through XE.com. Warning! There be spoilers for the upcoming movie below! Pirate Lord Hector Barbossa trying to capture Elizabeth Swann and fighting Jack Sparrow. Thoughts: Might be the only set with Elizabeth Swann. Should include plenty of treasure chests and gold pieces, but probably will be fairly small, given that there will be 3-4 minifigs starting out. Jack Sparrow and Will Turner fleeing from the cannibal village. Includes roasting spit, bone cage, chief’s chair, and cannibal hut. Thoughts: I could actually see some people buying several sets of the Cannibal Escape just for the minifigs and hut pieces. At that price, there is plenty of room for several cannibal minifigs along with the hut, etc. I would like to see some kind of bridge of sorts (if memory serves), but that would probably be pushing the price. Estimated Pieces: 350-450 (taking into account a number of minifigs, based on the Trash Compactor Escape 7596 with 370 pieces and 5 minifigs, Garbage Truck Getaway 7599 with 402 pieces and 4 minifigs, or the Quest Against Time 7572 with 506 pieces and 4 minifigs. Jack Sparrow, Will Turner, and Admiral Norrington fighting it out for a key, and then Jack and Will ending up in a mill wheel. Thoughts: Given the price, I think it could be one of the coolest sets. The price could certainly include enough parts to do a minifigure-scaled mill wheel that would hold some of the minifigs, but you have to remember, they might include the Mill itself. Probably a small set, with Jack Sparrow and some pirates. Maybe an incredibly cool brick – a “ship-in-a-bottle” and will be interesting to see how they pull that off. Thoughts: A cheap way to get Jack Sparrow into the hands of people. This could be a very cool set due to the “ship-in-a-bottle” brick (whatever that may be) and if the cabin is somewhat large. There are at least 3 minifigs plus the ship-in-a-bottle, and from a $16 set, don’t expect too large of a cabin. Thoughts: Probably fairly small – a pool of clear bricks, and basically a cheap and easy way to get the main pirate captains into the hands of people. Jack Sparrow and Joshamee Gibbs escape being hung, but are captured by royal soldiers, with mention of the streets of London and the “Captain’s Daughter” which maybe a pub of some sorts. Thoughts: I’m leaning towards this potentially being my second favorite set. At that price, it could have several redcoats, the hanging platform/gallows, and a small pub (or whatever the “Captain’s Daughter” is), along with perhaps some small shop fronts to make up the borders of the street chase. Thoughts: This could be my favorite set. At that price, it could include enough pieces to do a proper lighthouse. One would hope they would scale the lighthouse to match the Queen Anne’s Revenge. If it’s near Hogwarts Castle in price and number of pieces, it might even be a proper bay, with a large blue baseplate and some land in addition to the lighthouse and boathouse. The boathouse might even have a boat! Estimated Pieces: This one is tough. If the $112 US price is right, it could be pushing the $129.99 price of Hogwarts Castle 4842 which has 1290 pieces and 11 minififgs. Obviously Blackbeard’s ship, may also have Jack Sparrow, along with Angelica, and some zombies. Thoughts: Everybody will be focusing their attention on the Queen Anne’s Revenge obviously (more on that below in the general comments). Estimated Pieces: This one, like Whitecap Bay, is tough. If the price is close to $160, it’ll be above the price of the upcoming Diagon Alley 10217, which has 2025 pieces, but below the Imperial Flagship 10210. Now the Imperial Flagship only has 1600 pieces, but that was not a licensed set, and I would put it closer to Brickbeard’s Bounty (Brickset) from 2009, which has 592 pieces, 8 minifigs, and comes in at $99.99 US. I’m going to say, because of the intense spotlight that will be shown on this set, that we are looking at 900 – 1400 pieces. If my price guess is off and you knock off $30 and put it down around Hogwarts Castle 4842, while the Castle has 1290 pieces, it does not have sails and boat hull pieces. The $29.99 sets could actually be $39.99, which would put them into the territory of Hagrid’s Hut 4738 with a $39.99 price tag, 442 pieces, and 6 minifigs. There is potential for Capt. Jack Sparrow to be the new Harry Potter – that is, you’ll end up owning several very quickly if you pick up a few of the sets. That’s not surprising – they want to get Jack Sparrow into the hands of as many people as possible at all price points. Sounds like we’ll be picking up a bunch of zombies as well, which just so happened to have been one of the bagged minifigs. There does seem to be a focus on the fourth PoC movie with 4-5 of the sets, but that’s not surprising nor is it unwelcome, given that this is part of a marketing promotion. I hope there is a second round and that we see another ship or two (a Royal ship perhaps? ), or that they continue selling the LEGO Imperial Flagship 10210. I also hope that the Queen Anne’s Revenge is as detailed as the Imperial Flagship, but given the prices I’ve seen floating around, that’s doubtful. The Imperial Flagship runs to over 1,600 pieces and $179.99 USD, and you would have to tack a substantial bit on for licensing fees. When it comes to licensing, you always have to reduce the brick count when you have a licensed line. While the Queen Anne’s Revenge price is potentially approaching that of the Imperial Flagship, look for the brick count to be under 1200 pieces. I think out of the Disney licenses we’ve seen (Prince of Persia, Toy Story), this one probably has the most room to grow for a couple of reasons. First, it does somewhat fit in with existing Pirates sets (or rather discontinued Pirates sets). Assuming they don’t go out of their way to use really bizarre colors that just don’t fit with previous Pirates sets, they should mix and match very well. The MOC community will obviously love this line – it’s going to potentially give us some cool pieces, settings, and some really cool minifigs to work with. I’m kind of a fan of the Prince of Persia series and wanted to see a lot more sets in a Persian setting, but I think that’s being somewhat replaced by the Pharaoh/Adventurer sets and as far as I know, there are no movie sequels, so there is no incentive for more sets in the Prince of Persia universe. Toy Story was always going to be pretty limited as far as integrating it with non-Toy Story sets. 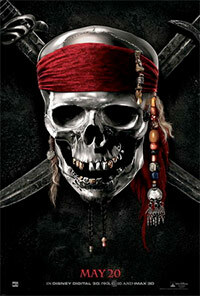 Pirate of the Caribbean – there is a lot of potential there. It’s like the Harry Potter sets. With all of the previous Pirates sets that have been released over the past few years, assuming there isn’t some kind of zany new color scheme, they should mesh well with one another.